The Euro continues to make small gains as the U.S Dollar loses ground following concerns about the future of the U.S economy and the effect of an aggressive Fed on the resilience of the U.S stock market. The market believes that the U.S economy is not heating up, meaning their is no reason for the Fed to continue hiking rates in an aggressive manner. This belief led investors into altering the long-end of the yield curve by purchasing long term Treasuries and pushing yields lower. A drop in these yields decreases the attractiveness of the greenback. From the Euro's side, no significant developments occurred relating to Italy's budget plan and the skepticism it is facing from the EU. The lack of developments on this front played a part in helping the Common currency rise with no significant downward pressure. 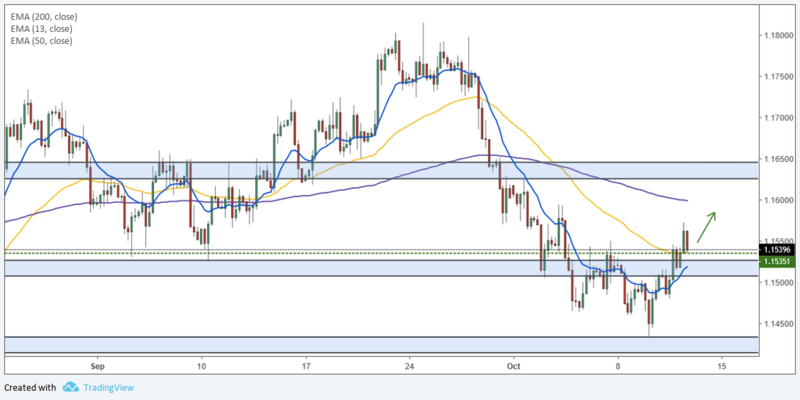 From a technical standpoint, the Euro broke above the 1.15351 resistance level which signals a possible rise towards the next price action resistance level at 1.16259. The break above the 1.15351 coincided with a break above the 50-period moving average signaling an improvement in the bullish momentum of the pair. Before tracking towards the 1.16259 resistance level, investors need to monitor how prices react around the 200-period moving average (purple) as it may serve as a barrier against a rise towards 1.16259.